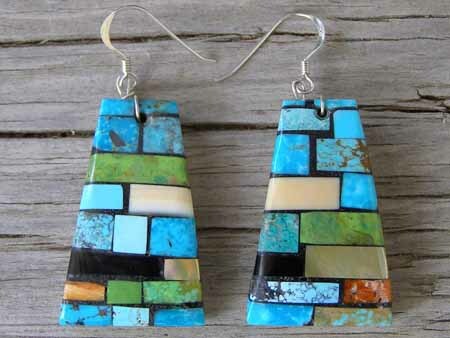 Bryan Tom sometimes does traditional silversmithing in the Navajo style, but he also makes mosaic inlay work in the style of Santo Domingo Pueblo. All mosaic artists have a sense of color which plays out in unique combinations. Bryan's skill in mixing colors is particularly attractive. The tiles are set on a foundation of melon shell. The drops swing freely from Sterling hooks. Size of drops: 1 3/8" x 7/8"